John knows all about homelessness, he himself, was homeless at one time. That’s why John and his wife Shelia want to do something about the issue today with their converted bus/van. John has tried to make a go at getting enough funds with publishing books on Amazon, blog, vblog, and now Patreon as well. Hopefully something will stick, Patreon looks like a good option for what they are trying to accomplish. The goal is to get consistent money coming in to make feeding the homeless possible. I see it here in my city. The homelessness problem in Seattle is huge. There are tents everywhere. The world needs more people like this couple. Yes, city governments and non-profits can do a lot, but lets not forget we (Individuals) can help too. It’s better to take action, go into the arena, than to stay on the sidelines. Yes, if you contribute there are several rewards for this campaign. 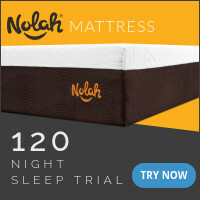 $50/month gets you 25% off camping coupon. $250/month gets you 40% off at the camping store. $750/month gets you 50% off at the camping store, 25% the clothing line, pictures of their progress, help your hometown, and meet the couple in person! 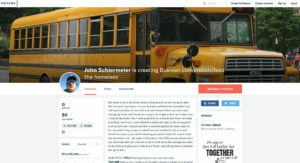 If you are interested in helping John and Shelia out with their ambitions of traveling around the United States and helping solve the issue of homelessness consider donating to their Patreon campaign today. 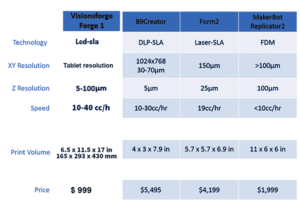 What separates the Visionsforge SLA 3D printers is first the cost, second it’s the world’s first 3D printer to use the like of a regular tablet to cure the resin, and number three it’s an industrial grade, 20.000 CC 3D printer. This 3D is above and beyond your standard 3D printer. The Visionsforge Forge 1 best of all will be easy to use, it’s a professional 3D printer for the masses. The goal of the Switzerland made Forge 1, says founder Fabrizio Guadagnino, is to start 3D printing in “10 min. or less.” Yes, that’s right that’s opening up the box, setting up, and printing a 3D object in 10 minutes or less! The Forge 1 comes fully assembled so right away you’re almost there. The process could not be simpler, the company is taking out all the guesswork and hassle in 3D printing. – Wifi connected. No cables to worry about. – It’s quiet, precise, and effective. – Print volume is much better than the competition. – Easy and intuitive print software. – Designed to last decades. 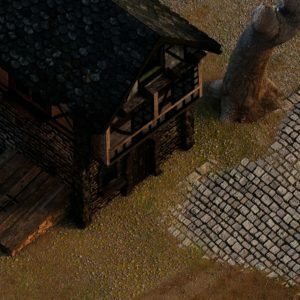 The goal of the Visionsforge Kickstarter campaign is $40,433. The company is well on their way to meeting that goal with about 25% funded already. The money raised will cover the costs of manufacturing, marketing, and distributing the initial run of Forge 1 printers, getting this product into homes and offices around the world. The Forge 1 Kickstarter campaign officially launched December 21, 2017. Unfortunately, the early bird packages are limited to only 100. Yes, there are several rewards especially if you’re one of the early backers. 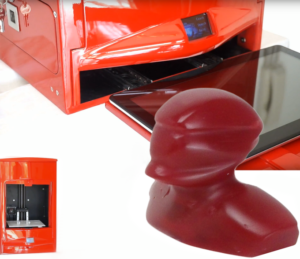 The Super early bird price on this is $909 for one Forge 1 printer and resin pack. The second funding reward is pledge $1212 and get early bird pricing on the Forge 1 plus a 13.3 inch tablet, and resin pack (I recommend getting this one). Next there is the Early bird pricing 1 level for $1313 get a Forge 1, tablet, resin pack, and automatic resin management. The final reward offer is called Early bird pricing 2 and with this package get a Forge 1, tablet, resin pack, resin management, resin tank, and additional VAT. For every Forge 1 printer that is sold Visionsforge will plant a tree. Right now over 50 trees have been planted. That number is growing daily. 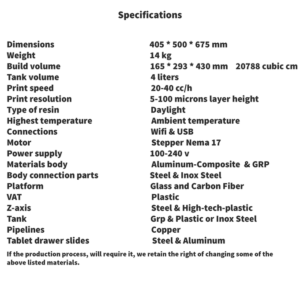 The specs of this 3D printer are very impressive, but that’s not all that makes the Forge 1 impressive. The machine is designed to be upgraded. For example swapping out tablets, just open up the drawer and remove the previous tablet, done. The Forge 1 was created to last decades. Instead of replacing the unit it’s designed to adapt to changes in design and technology. If you are in the market for a 3D printer there really isn’t any reason not to pick up one of these Visionsforge Forge 1 3D Printer. Consider funding their Kickstarter campaign or pick one up by meeting a funding rewards milestone. Founder Fabrizio Guadagnino goal is to bring high tech, high quality, professional 3D printers to the masses and I think with the Forge 1 this will be possible. Growing up my favorite games on Nintendo, Super Nintendo, Playstation, then later Xbox 360 were always the RPG games. My favorite RPG series of all time has to be the popular Final Fantasy Series. 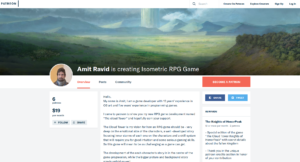 If you’re like me and share a passion for good RPG games then please consider supporting Amit Ravid, game developer, who’s creating “The Cloud Tower” a reimagined look at traditional role playing games. “The Cloud Tower” is a Amit Ravid’s vision on what RPG should be. Set in medieval times it’s a game that deeply focuses it’s story on the inner emotional turmoil of its main characters and a skill system that will require you for good intuition and some serious gaming skills. The game focuses on each characters personal story while at the same time there is an important background story and bigger picture. So far Ravid is finishing up the environment until the end of October then he will start working on the video game code. The Patreon is currently being funded by 6 people for a total of $19/month which is actually a great start. Are There Any Rewards For This Patreon? Yes, like most Patreon campaigns there are several reward levels. $1 gives you a special edition of the game, special thank you, and access to special Patreon only posts. $3 or more per month gets you all previous plus a digital copy of the black king’s diary. Rewards go all the way up to $5/month and that gets you all previous rewards plus early access to release versions. Personally I think the game looks amazing. I cannot wait to get my hands on this new RPG game. The two most enjoyable things about role playing games is the character journey and solving challenges. With the “The Cloud Tower” Amit Ravid has raised the bar on these two most important RPG concepts in what could be one of the great future classics of the RPG genre. Help get this game created and support Ravid’s RPG video game today. You’ve probably heard it before. The world needs more role models and for the most part I think there are plenty of positive role models to choose from. Things change when you ask how many role models are there for children, especially girls? The answer is probably not many. There are even fewer positive role models for girls in the arena of comic books. That’s why supporting this Patreon campaign is so important, especially if you agree with what I just said. The goal of the Future Girl Comic Book campaign is just $10 per post, right now it’s just 18% complete. Once the $10 per post goal is met the team will publish pages 2-5 of Issue 1 (page 1 is free for all to read). $2 or more per post gets you all previous benefits plus the print version of Future Girl (After 5-7 total payments). 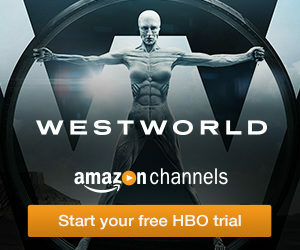 Yes, there are several bonuses. For $1 per post or $0.25 per page depending how you look at it you will get access to the Patron only blog where they publish the Future Girl comic in digital format. You can also have the print version send to Children’s Hospital in your name at $2 level. $3 gets you access to digital copy as well as special addition print version of the comic book. $5+ gets you all previous plus a signed copy of the print version! Lots of bonuses at very reasonable contribution levels. Time and time again you hear, “We need more positive messages in our culture.” Well now here’s a chance to put your money where your mouth is. It won’t break the bank either, $1 per post (1/4 of a Starbucks Latte), you can help support a team of artists and foster a positive message. The Future Starts Now! Lets make sure it’s a better one. Please consider donating to the Future Girl Patreon campaign today. 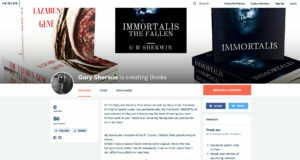 Gary Sherwin author of Immortalis The Fallen needs your support on Patreon. 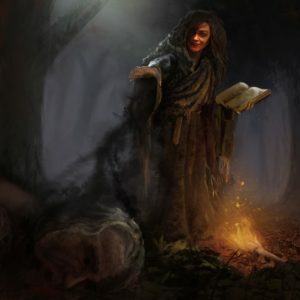 Sherwin has been a professional writer for nearly a year, Immortalis is his first book. If you enjoy sci-fi, horror, and thriller themes mixed into novel consider supporting Sherwin’s Patreon campaign today at https://www.patreon.com/Gsherwin. The world needs more writers like Gary Sherwin. Gary has one big issue he needs Patreon’s help with. Sherwin can write far faster than he can afford to publish his creations. That’s where all the good people in the Patreon community come in. This Patreon campaign will help the author with editing, advertising, and everything else that’s associated with marketing. The $1 donation level gets you access to Patreon only content and sneak peak photos. $3/month gets you behind the scenes, all previous rewards, access to alpha advanced group on Facebook Sherwin Publications, and digital copy of books before their release. The rewards go all the way up to $50 and that will get you all the previous rewards plus a signed copy of the book! There is no specific goal to this campaign other than to get monthly donors. Gary Sherwin has enjoyed reading since he was a child, getting lost in other worlds created by great writers. Finally, Sherwin in his early 20s, began to write and create his own works filled with mystery and rich characters. After a long struggle perfecting his technique a first book was created. Make sure Gary Sherwin can continue his life long dream of being a professional writer by supporting the Patreon campaign today. The current prototype already shows great promise. It has shown to be functional, effective, and reliable. 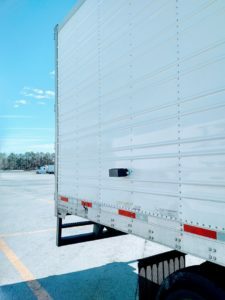 This model is detachable, allowing the driver to change position of the camera to any desired location. Yes, there are several rewards for this campaign. $1 gets you a thanks, $20 gives you a branded pen, $50 gives you the pen and a thank you, $75 gets you everything and a shirt, $150 gets you everything and a personal thank you video, and finally $200 gets you everything plus the Blind Side View camera system.